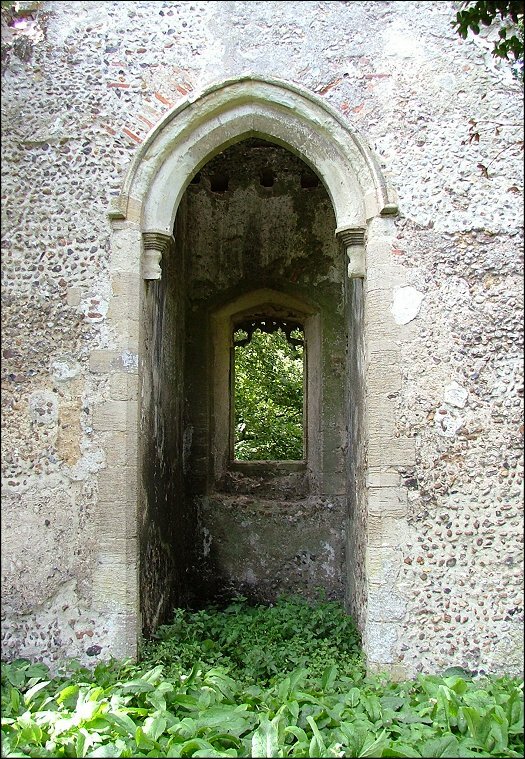 Norfolk, famously, has more ruined churches than any other county in England. What may be more significant to the judgement of history is that it also has very many churches that have survived against all the odds, when there was no particular reason for them to continue existing; indeed, some of them had already fallen into a ruinous state before being saved. 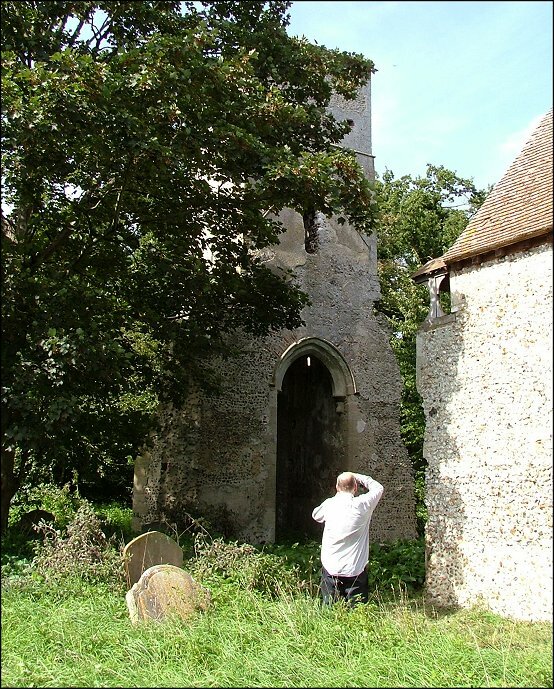 Think of Little Witchingham, Cockthorpe and Waterden, think of Bob Davey's remarkable work at Houghton-on-the-Hill, and everything that the Blessed Billa Harrod did to encourage people through her work with the Norfolk Churches Trust. 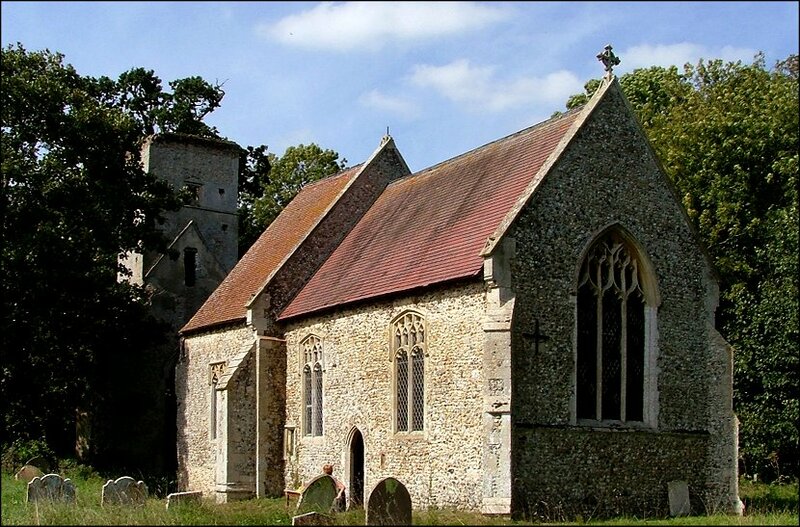 Because of them, we still have so many churches that have not merely survived, but, often outside of the parochial system, are still in use for worship - think of Barmer, and Dunton, and the wonderful Warham St Mary Magdalene. It should be obvious, I suppose, that the smaller an institution is, the more effective its work will be at a local level. Billa Harrod understood this well, and we forget today that the main thrust of the Norfolk Churches Trust was not to take on redundant churches itself, but to encourage local people to take them on, and to facilitate this happening by showing them how to attract funding, and pointing a way through the legal jungle. 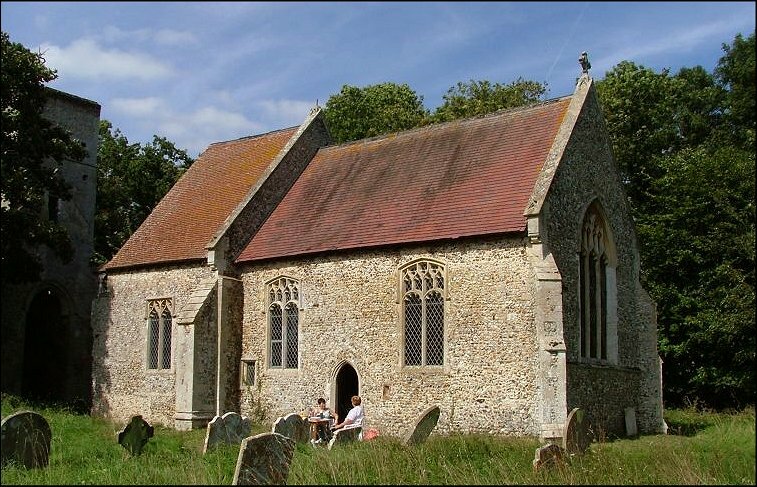 And it is a proud boast of Norfolk that, despite its two Anglican Dioceses declaring more churches redundant than in just about any other county in the 1970s and 1980s, hardly any of them fell into ruin or became private houses. Hargham, pronounced harf'm, was already a ruin, of course. The western bays of the nave collapsed in the 18th century, an unfortunate date because this was a low point in the history of the English church. The nave was never rebuilt. There was obviously a major restoration in the late 19th century to the chancel, but by the middle of the 20th century it had become a ruin, the building full of ivy and elder. It was rescued in the 1970s by a local couple, Clifford and Jacqueline Amos. 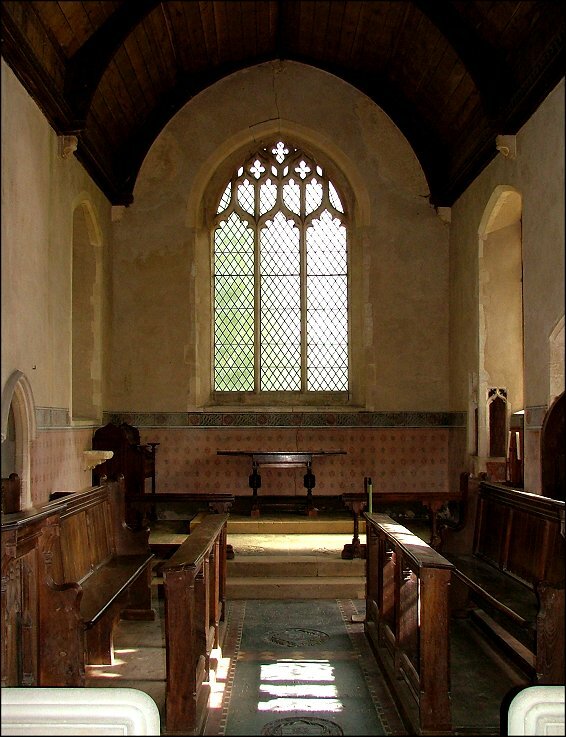 He was a builder, and set about restoring the integrity of the chancel and what remained of the nave. The couple still maintain the building to this day, leaving the tower to grants from funding bodies to keep it standing. "When Lady Harrod came, she didn't just stand and stare, she got down on her knees and scrubbed the floor with the rest of us!" Jacqueline Amos told us. It was a mark of the love that is lavished on this pretty little church that it was participating in the Historic Churches bike ride day, while the nearby parish church in the large village of Shropham was not. Inevitably, the saving remnant of All Saints is an odd one. 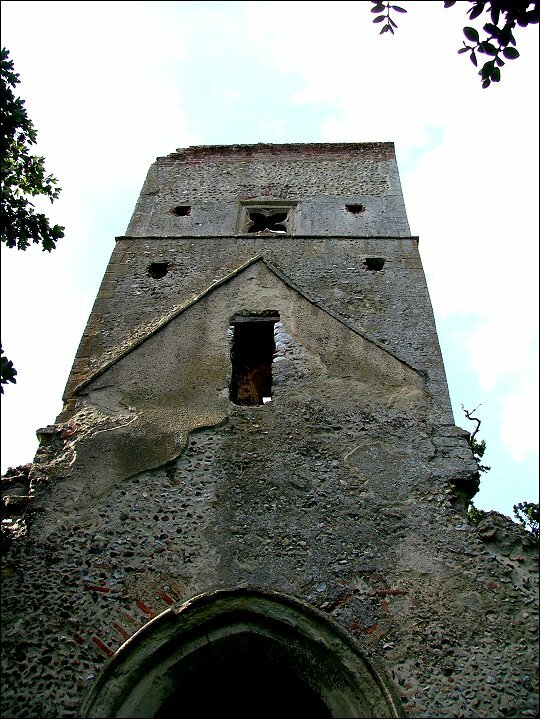 The tower stands alone, about seven metres to the west of the body of the church, which has a door built into the new west wall. The nave consists of just a single, narrow bay, separated from the long chancel by a rather startling low white screen. 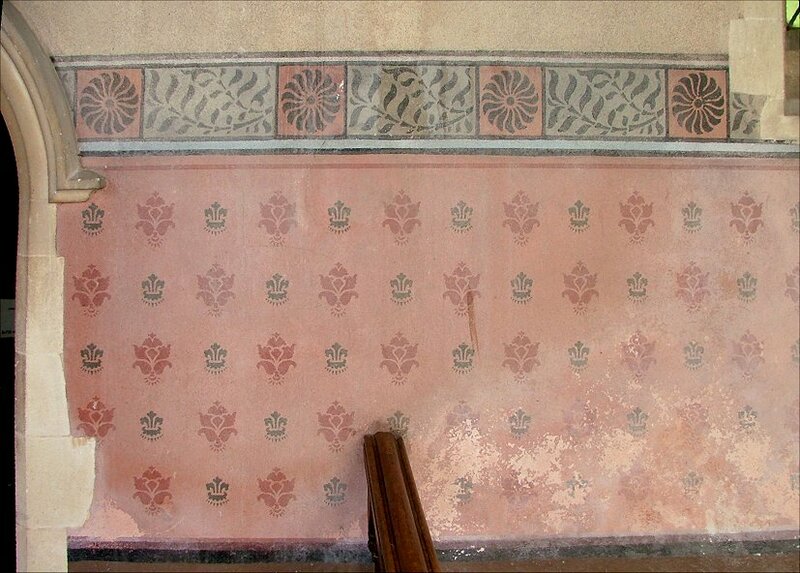 The chancel is decorated by late 19th century stencilling. 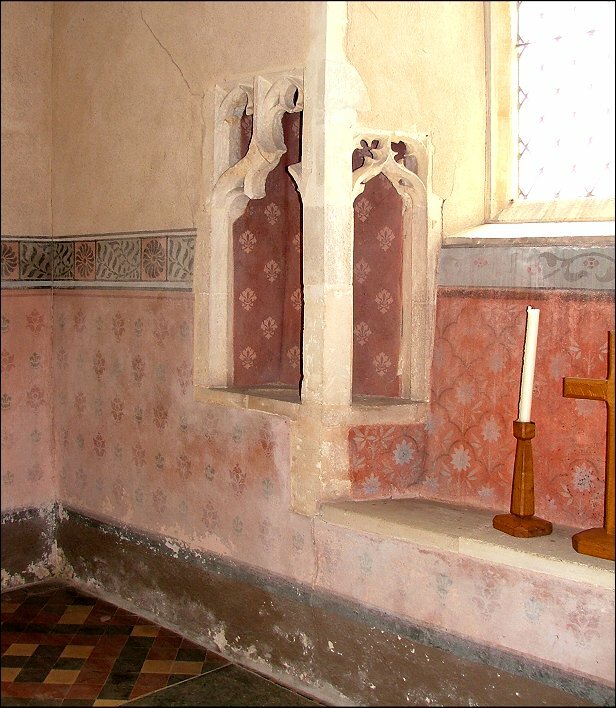 This kind of thing once exisited in thousands of churches, but as it fell out of fashion or repair it was whitewashed or painted over almost everywhere. 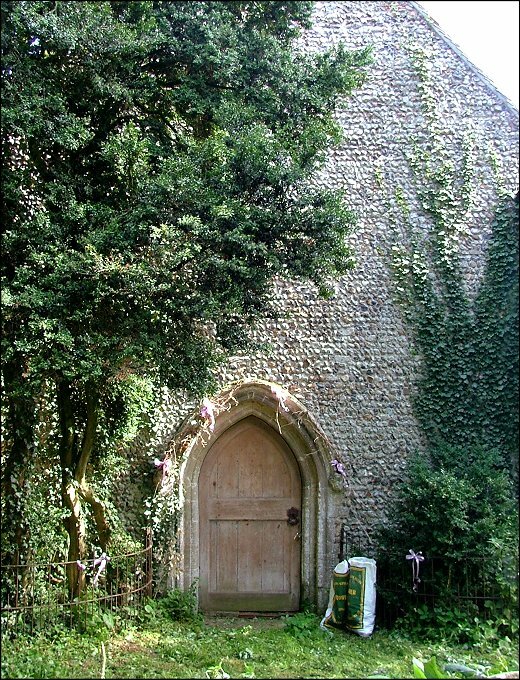 It now survives at less than half a dozen churches in Norfolk. Despite the overwhelming Victorian interior, there are some intriguing medieval survivals. 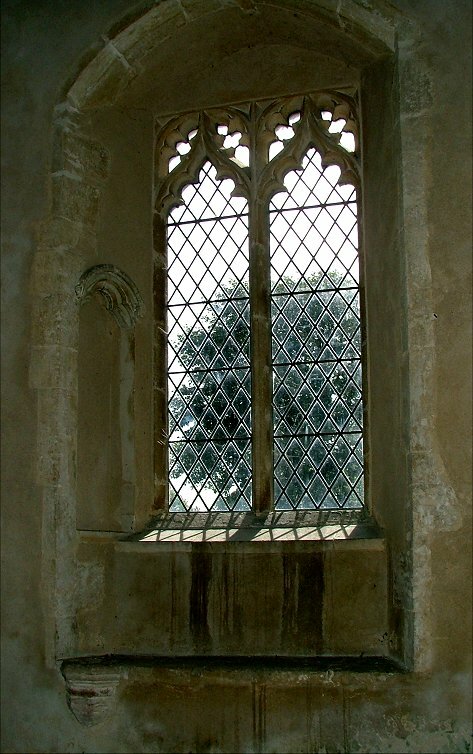 In the single south window splay of the nave is a beautiful image niche with a cusped canopy. 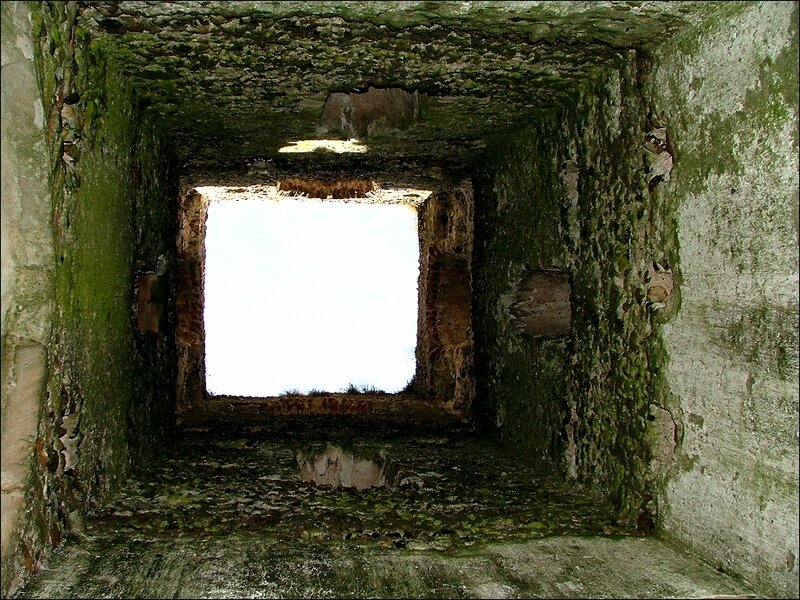 Set into the sill beneath it is a piscina, showing that the structure here was built with the intention of a nave altar in mind. Eastwards, beyond the priest door, is a squint from outside the church. Was it intended to allow a view of the altar from a built-on hermitage, now lost? And beyond that, a beautiful piscina with access from the sedilia beside it. This simple, relatively unimportant church is no mere museum. When Mortlock came this way in the early 1980s, he recorded that the church had recently been used for a sacramental purpose for the first time in decades: Marina Amos, the daughter of Clifford and Jacqueline, was baptised here. Some twenty five summers later, when we came here in 2006, it was just a few months after she had got married; again, the first marriage here in decades. What a wonderful expression of local involvement over the years!